We love to entertain at our house. Do you? For us, having friends over to socialize is a fun way to spend a few hours on the weekend after the slog of a hard week’s work. And that doesn’t have to mean having a dinner party which can mean even MORE work. Sometimes easy appetizers and drinks are the way to go! What is an appetizer, anyway? Are soup and salads considered appetizers? Some people think so, but the real answer is no. Soup or salad is a starter or first course to a main meal. Appetizers are small bites or a small dish of food taken before a meal. The intent of an appetizers is to stimulate one’s appetite. Many cocktail parties feature appetizers to go along with drinks. 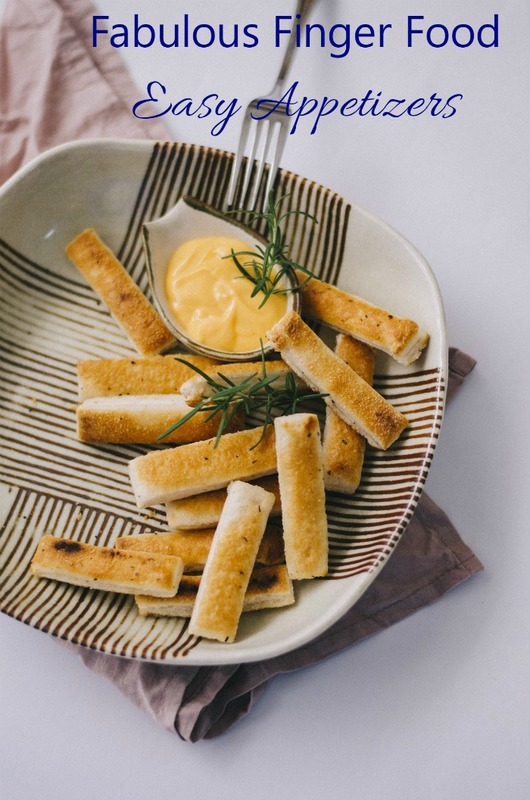 If you lead a busy life, coming up with a new appetizer to serve guests at the end of a long day (other than a plate of crackers and cheese) might seem like a challenge. But not so with these easy appetizers. They are simple to put together and your guests will love them all! From chicken legs to dips and small bites, these recipes are a party in your mouth all on their own! Finger food is the way to go for easy appetizers. Crostini and crackers topped with your favorite toppings are quick and tasty ways to serve your guests. Asparagus Crostini with Gouda Cheese and Proscuitto – Amazing flavors on a home made crostini. Bacon Wrapped Asparagus – Hearty, salty, tasty and fun! Cream Cheese Appetizers – Tomato, spring onions combine with cream cheese for a savory party bite. 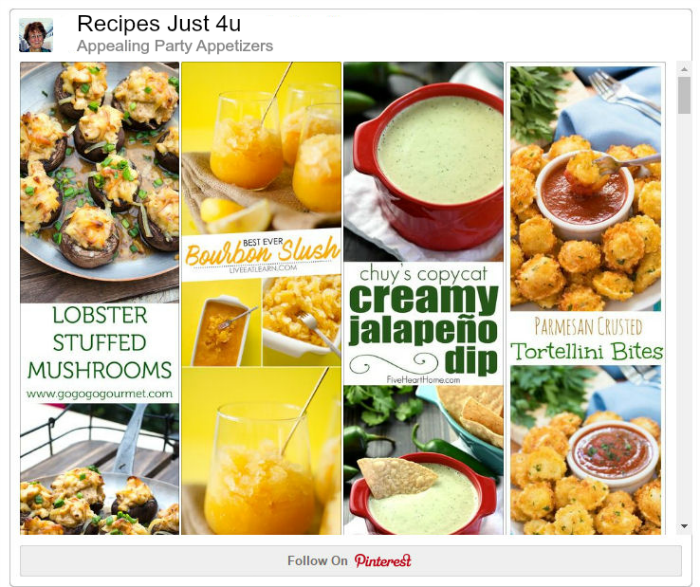 Easy Party Crostini Appetizers – Four different toppings for four amazing tastes. Ham and Spinach Pinwheel Appetizers – Hearty wheels of tasty goodness. Home made Garlic Toast – Great to use for dipping! Pizza Cups – The perfect appetizer for a slumber party! Saucy Asian Meatballs – Little bites of ground beef and pork with spices. These toasted pecans have a lightly sweet cinnamon maple glaze and lots of crunch. They are perfect for parties. These amazing dips run from sweet to hot and savory. Dip with crackers or fruit for the easiest of party appetizers. Chocolate Hazelnut Fruit Dip – Paleo styled dip to serve with fruit. Creamy Pumpkin Dip – Looking for a Halloween or Thanksgiving dip? This is the one for you! Hot Spinach Artichoke Dip – A traditional party favorite. 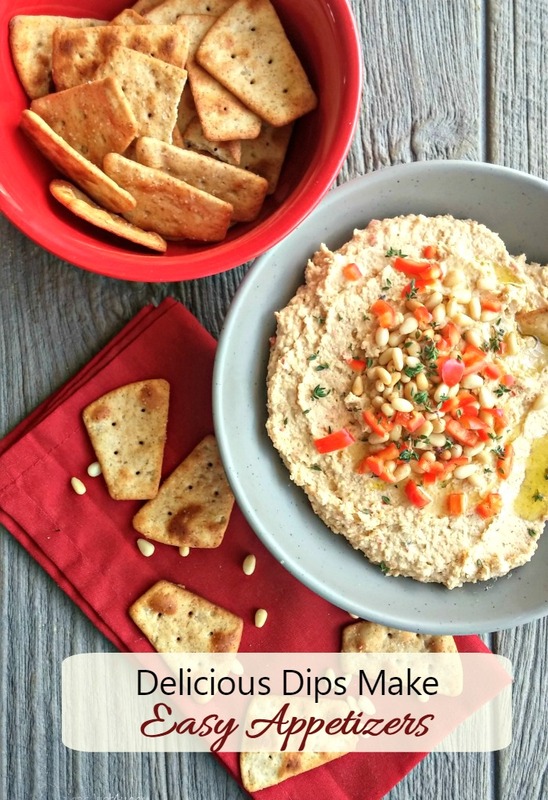 Red Pepper and Toasted Pine Nut Hummus – Make it in minutes for a Mediterranean Flair. The Descendants Hawaiian Dip – Cream cheese and pineapple combine for this holiday style dip. White Chili Queso Dip – Perfect for Cinco de Mayo or any time of the year. Salsas, cheese balls and small bites galore. 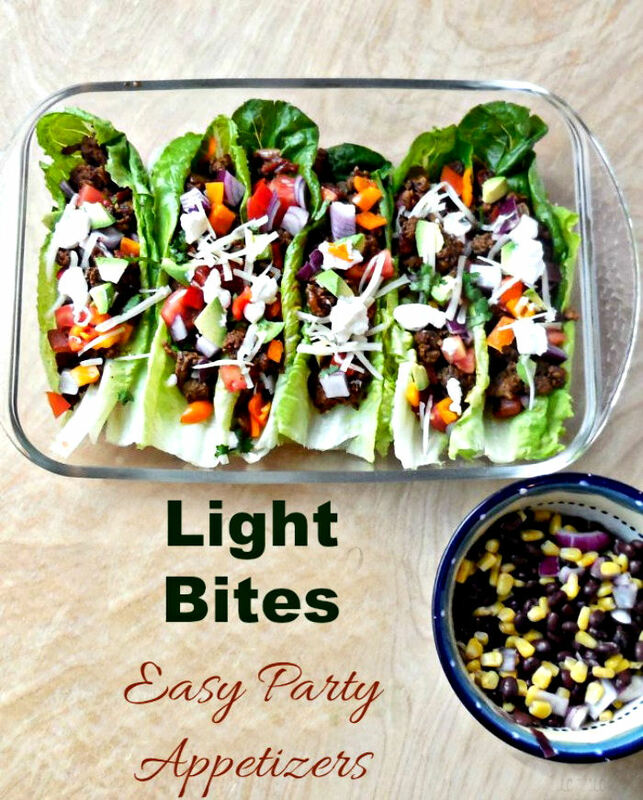 Beef Taco Lettuce Wraps – A healthy alternative to normal wraps. My guest love them! Football Cheese Ball – Easy, spicy and fun football shape cheese ball that is perfect for game night. Game Day Cheese Balls – Sweet or Sour, you get to choose. Garlic Lemon Roasted Shrimp – Bites of savory perfection. Grilled Shrimp Tostadas – Serve these piled high on a small tostada for some hearty appetizer fare. Phyllo Pastry Appetizers – Super easy to make and so tasty! Shrimp with Garlic and Parsley – Savory bites flavored with paprika and white wine. 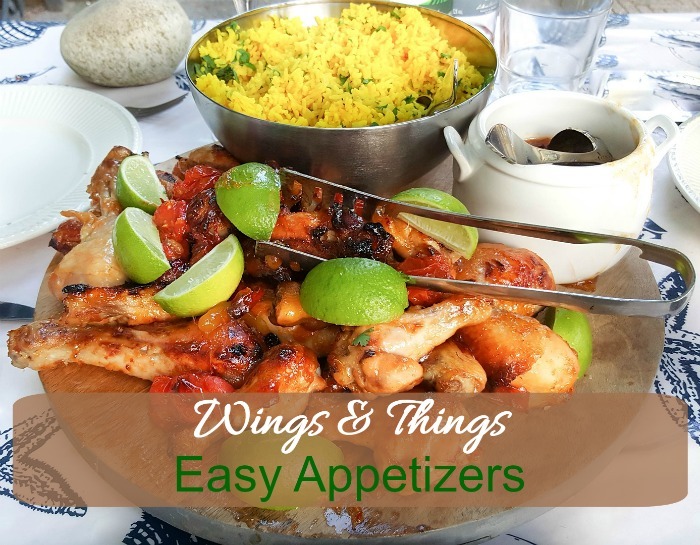 Spicy Chicken and Bacon Appetizers – Serve them with Micheladas! Strawberry Peach Jalapeño Salsa – Perfect for Cinco de Mayo! Shrimp, and chicken tenders are small and can be cooked in so many ways as appetizers. Check out these tasty ideas. Baked Chicken Paprika Drumsticks – Serve these to your party guests and the platter will be gone in a flash. Beer Battered Coconut Shrimp – The only thing left on the platter will be crumbs. Grilled Chinese Chicken Kebabs – Put them on the grill and wow your guests. Lemonade Grilled Chicken Legs – The Marinade is amazing for an outdoor BBQ party. Pretzel Crusted Chicken Tenders – Forget take away, this easy recipe makes chicken nuggets seem like child’s play! Party appetizers don’t have to stop at savory. These small bites of sweetness are a perfect pairing with port or sherry. 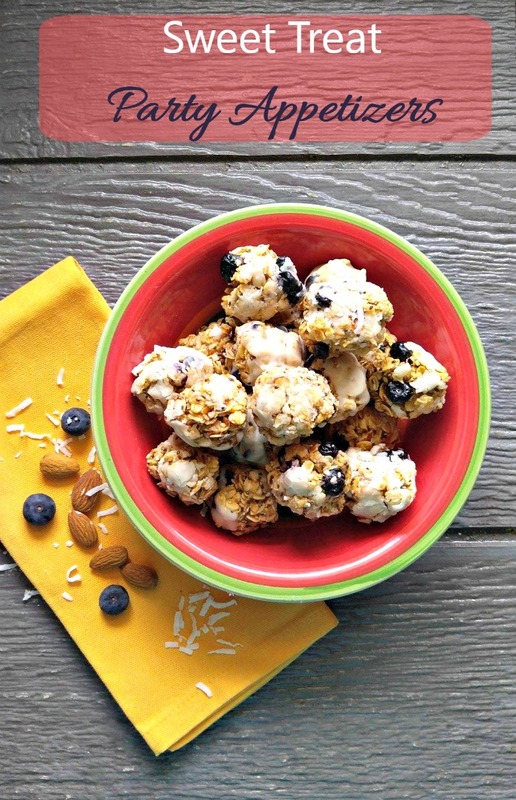 Blueberry Energy Bites – The topping is dairy free and the taste is amazing. Chocolate Peanut Butter Bites – Like a Reese’s Cup in a ball of flavor. For more great ideas, check out these easy party appetizers from The Gardening Cook. There are hundreds of cookbooks and serving dishes for easy party appetizers. Having one or two on hand means being able to put together a cocktail party with ease. Still need some more inspiration? 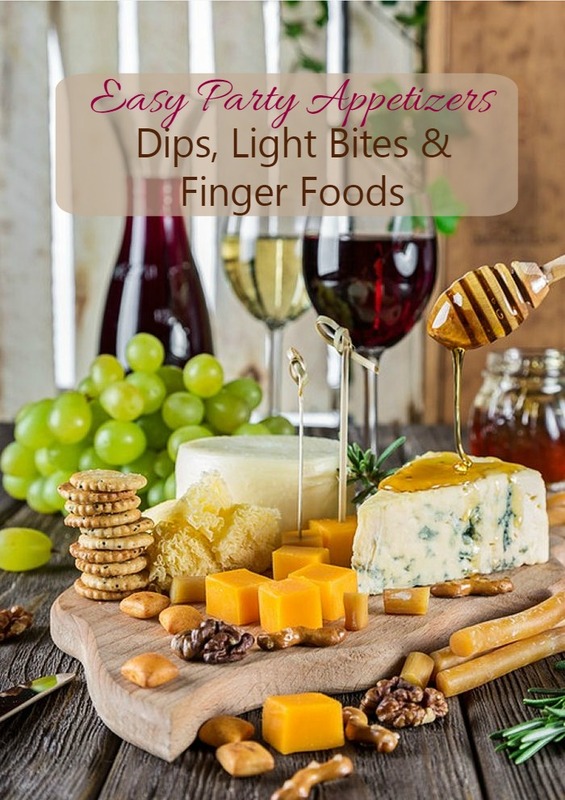 Be sure to visit my Pinterest Appealing Party Appetizers Board for loads of easy finger food, dips and lite bites to share with your guests. If you enjoyed this recipe collection, you may be interested in these, too. Cocktail Recipes – Bar tend like a barista! Shrimp Recipes – Many of these can be used as appetizers, too. Cheesecake Recipes – Got a sweet tooth? Try one of these. One Pot Meals – Make clean up a breeze with these easy meals.